Does your glue gun drip excessively, constantly wiping excess glue? There are many factors at play with glue guns that drip excessively and we will try and cover off the main points to help you get the best from your glue gun. 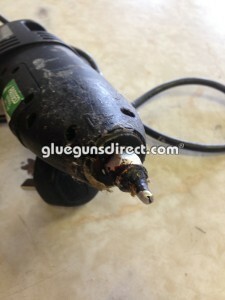 The glue gun is often the first point of call for faults when the molten glue is constantly dripping from the nozzle. First of all check your nozzle, is it clean, does the nozzle have a true orifice? See picture below of a typical nozzle that’s been used hard and is now under performing and dripping, look familiar? Glue guns that have been left on for too long a period without use (often 30 minutes or more) on a regular basis suffer from the risk of charred glue blocking the nozzle or stopping the ball and spring inside the nozzle from operating allowing the molten glue to flow without trigger pressure. Damaged nozzles due to hard work need to be replaced for optimum performance! What to do next: Keep the glue gun nozzle clean with a powerful hot melt cleaner such as, Henkel Melt-O-Clean, turn your glue gun off when not in use, replace damage or worn nozzles. Often the cause of excessive dripping! Please always use Tecbond glue sticks with Tec glue guns as these glue sticks are made to a very high specification and designed to work exceptionally well through the range of Tec glue guns. We have seen cases were imported competitor grades have been used in a Tec glue gun with high excessive dripping, yet when Tecbond glue sticks where put through the same tool there was no dripping! Our friendly sales team will be pleased to supply samples of Tecbond glue sticks upon requested. There is always a risk of “glue melt back” or “glue back up” from imported glue sticks often due to their diameter falling below the recommended size for a Tec glue gun or the resins used in their manufacture which may require the tool to run at lower temperatures to prevent dripping. Tec hot melt glue guns operate at 195c and Tec low melt glue guns operate at 130c designed for Tecbond glue stick range which are formulated to run smoothly with all Tec glue guns. Are you using a Tec glue gun, use Tecbond glue sticks! You should always choose your Tec glue gun according to the kind of Tecbond glue being used, the dispensing rate you need and the nature of your project. High temperature glue guns cover the majority of Tecbond glue stick formulations, which offer a wider range of options for bonding. Low Melt glue sticks operate at a lower temperature and are therefore safer to use, as risk of burns are reduced. However, Low Melt glue sticks only come in a selected range and are usually used for bonding heat sensitive materials like polystyrene. You should never use Tecbond Low Melt glue sticks in a Tec hot melt glue gun (or hot melt glue sticks in a low melt glue gun) unless specifically directed by a member of the GlueGunsDirect Team.